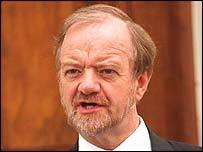 Robin Cook has resigned from Tony Blair's cabinet as the build-up to war with Iraq gathers pace. The decision by the House of Commons leader, one of the highest profile figures in the Labour Party, came as the Cabinet held an emergency meeting in Downing Street. The UK, US and Spain have effectively abandoned their efforts to find a diplomatic solution to the stand-off. They are not putting their draft resolution to a vote in the UN Security Council - citing French intransigence. Foreign Secretary Jack Straw is set to make a Commons statement about the crisis at about 2200 GMT on Monday. Amid growing disquiet among his backbenchers, Mr Blair will address the Parliamentary Labour Party ahead of a Commons debate on Tuesday. Mr Prescott said the prime minister would ask for support if the "last resort" of war was needed, and would be setting out the humanitarian effort to rebuild Iraq. MPs will also hear on Monday evening a personal statement from former Foreign Secretary Mr Cook. As he left the government ranks, Mr Cook, who saw Mr Blair before the cabinet, said: "It is with regret I have today resigned from the cabinet. "I can't accept collective responsibility for the decision to commit Britain now to military action in Iraq without international agreement or domestic support." Mr Cook is the first senior figure to quit over Iraq policy and it is being seen as a major blow to Mr Blair as he faces a growing rebellion within his own party. His departure was called "very honourable" by former cabinet minister Chris Smith. Liberal Democrat foreign affairs spokesman Menzies Campbell was unsurprised that the "ambiguity" of the government's position was too much for Mr Cook to tolerate. But Environment Secretary Margaret Beckett said that everybody in the Cabinet including the prime minister had anxieties about the idea of a war. "But none of the rest of us feel that they are enough to make us judge that the government is doing the wrong thing," she told Channel 4 News. For the Conservatives Michael Ancram urged Mr Blair to ensure his cabinet spoke with one voice. Well done for not selling your soul Robin! A poll conducted by ICM for the Guardian suggested that public backing for the prime minister's stance on Iraq may have increased. 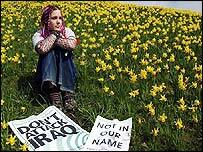 However another poll - conducted for the Sun by Mori - suggested 63% of the public are opposed to a war. Meanwhile, the Foreign Office advised all Britons in Kuwait, except diplomatic staff, to leave the country. The UN ordered weapons inspectors and humanitarian personnel out of Iraq. The attorney general, Lord Goldsmith, said legal authority for war came from three previous UN resolutions. In an effort to win over sceptics ministers are repeating assurances about the security of Iraq's oil reserves and efforts to resolve the Palestinian crisis. Ex-Labour whip Graham Allen and a group of MPs, including Mr Smith, are drawing up the amendment. It would make clear their support for British troops but challenge the "moral authority" of war. The Stop The War Coalition is this Saturday organising a repeat of last month's peace rally, which attracted between 750,000 and two million people. "As the cabinet gathered there were more questions than answers"